Not to be confused with Lakitu King. King Lakitu is a boss appearing in the game Super Mario Galaxy 2. He is a large Lakitu that is fought in the Yoshi Star Galaxy in the mission Spiny Control. 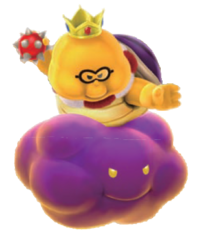 King Lakitu is an overweight Lakitu that has a purple shell and rides on a purple cloud with yellow eyes (same color scheme as Dark Boo). He has a gold crown and wears a pair of glasses along with a red and white ruff around his neck. King Lakitu, Mario, and Yoshi. King Lakitu mainly attacks by throwing Spinies at Mario. Mario will need to use Yoshi for the battle. After King Lakitu throws a Spiny, Mario will need to use Yoshi to eat it. After the Spiny has been eaten, Yoshi will need to spit the enemy out at King Lakitu. After he is hit, King Lakitu will throw even more Spinies, move at a faster pace, and unleash a new attack. He will grow bigger and move around the stage, releasing lightning from underneath his cloud. This attack will instantly defeat Yoshi. After he is done with the attack, King Lakitu will continue throwing Spinies. After he is hit again, he will throw even more Spinies. After he is hit once more, he will be knocked back and fall through his cloud. Mario is granted the Power Star after this. King Lakitu can be stunned by shooting a Star Bit at him. Throughout the battle he will occasionally stop and laugh at the player, leaving him open to be attacked. King Lakitu is the only boss whose name is not mentioned anywhere (dialogue or mission title) in the game. King Lakitu's battle theme is the same as the Stink Bug Parent's and Boulder Bowl Galaxy's "Rolling Crabber Romp" mission's theme. Overall, this theme is a variation of Baron Brrr's and the Deep Dark Galaxy Undergrunt Gunner's theme from Super Mario Galaxy. If the player leaves the arena while battling King Lakitu and waits for a few seconds, King Lakitu will take a nap until the player reenters the arena. This can also be used as another strategy, leaving him immobile and an easier target if Yoshi has a Spiny in his mouth. Within the game's code, there is an unused texture of King Lakitu without his glasses. King Lakitu is similar to Lakithunder, another Lakitu boss who rides a cloud capable of shooting lightning bolts. ↑ Browne, Catherine. Super Mario Galaxy 2 PRIMA Official Game Guide, pgs. 43-49. ↑ TCRF. Super Mario Galaxy 2. The Cutting Room Floor. Retrieved 25 July 2011. This page was last edited on April 2, 2019, at 00:07.